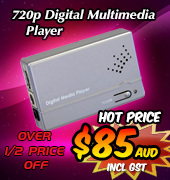 This HDMI Scaler Box has been designed with the most up to date video conversion technology available, with auto input-signal detection and default "Native" output connection to your HDTV. 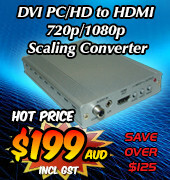 Automatically, this inbuilt EDID functionality between the HDMI Scaler Box and your HDTV ensures a display first time. Once the video source equipment, the HDMI Scaler Box and your HDTV are syncronised together, then use the OSD menu to make changes to best suit your viewing needs. Have full control over the way the video displays, from setting video basics like brightness, contrast and colour intensity, to changing the scan function size and aspect ratio of the image to better fill the HDTV screen. For instances where you need to mix different video formats like PAL and NTSC, then the HDMI Scaler Box easily adapts one video format to the other. A full range of standard and high definition video resolutions in both formats are accessed via the OSD menu. Select the best option that either increases or decreases the output resolution needed to best optimise the display to the HDTV screen. The HDMI Scaler Box also has a couple of additional functions available, such as "still image" and "mirror image", again accessed and selected via the OSD menu. As implied, these functions add a new dimension to the viewing and display of videos, whether at home, in education, or in advertising applications. You are welcome to visit the HDMI Scaler Box webpage for more details, just click here to access the page. Read more details about the Features and Specifications of this product and you may download the free User Manual at any time. To purchase the HDMI Scaler Box, simply Add to Cart and follow the 3 easy steps to order and make payment. 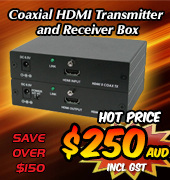 If you have any questions or special requests for the HDMI Scaler Box, then please do not hesitate to contact to our friendly Staff via email on or telephone +61 (0)2 4968 9313. 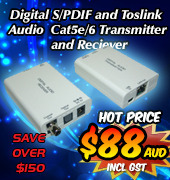 For Fax enquiries, please call +61 (0)2 4968 9314 and send through your details. Thank you again for taking time to read this article and we look forward to any feedback or questions that you may have.